Entering “The Pebble Drinkers” is akin to being immersed in a three-dimensional Rorschach Test. This group show at Gallery Aferro is comprised of work replete with symbols and associations that tell us much about the artists’ experiences and beliefs, while simultaneously eliciting psychological responses from the viewer. The exhibition encompasses a range of media and narratives. Each artist employs their own clearly developed lexicon that expresses different concerns manifested in a rich array of visuals. The glue that holds this exhibition together is the application of these artistic vocabularies, bridging the gap between the wildly divergent media and themes. 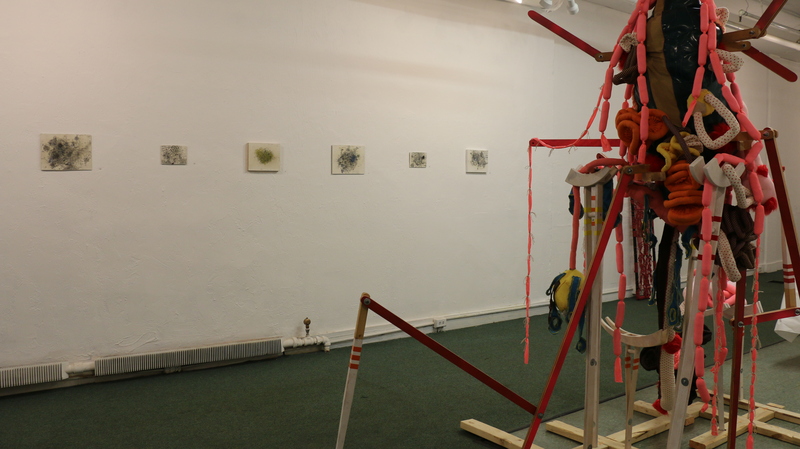 Stephanie Williams’ “Ernie’s Self-Edit” is an amalgam of sewn forms arranged over a wooden armature. This loosely defined figure seems disemboweled; spilling an assemblage of cascading textiles resembling intestines, female reproductive organs and sausage links. The macabre sentiment is offset by the bright color palette and ornamental stitching that heightens the tension between allure and disgust. Williams’ goal is to make reflective objects that are collections of ideas and senses born of her own experience, while leaving room for the viewer to insert their own. Corwin Levi’s stream of consciousness mixed media pieces on panel read like schematic drawings. They are concomitantly maps, medical diagrams or molecular charts. Densely overlaid with text and image, they provide a hazy, hypnagogic terrain for viewers to unravel. The modest scale beseeches earnest looking and thus implicates viewers in the act of deciphering the clues held within their nebulous confines. The density of imagery and text is deftly offset by the simple elegance of the black lines set atop a mostly neutral ground. A.V. Ryan’s Gravitas series of sculptures provides a respite from the busy quality of Willams and Levi’s work, but are no less effective in eliciting a strong emotional response. These elegant white forms, set atop pedestals, draw upon long-standing traditions of sculpture with allusions to the body and draperies. 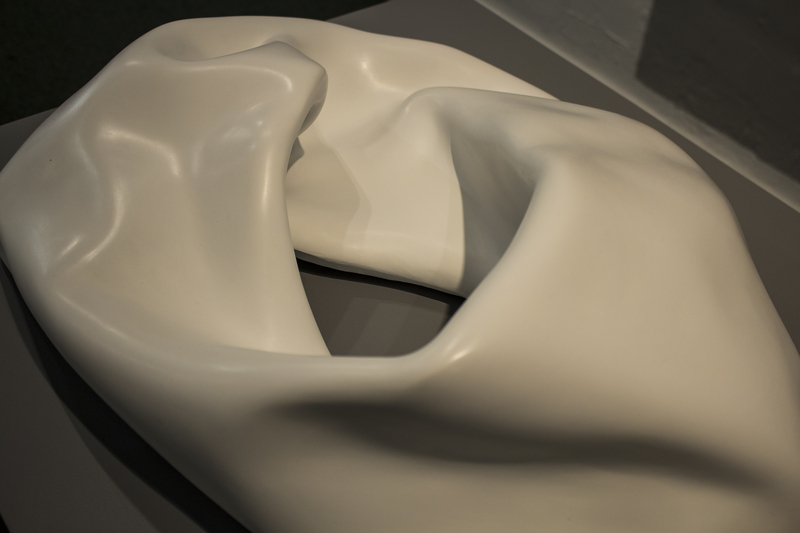 Approximating the sensual Modernist figures of Henry Moore and Barbara Hepworth, upon closer inspection these bodies melt into deflated abstraction. This push-pull of absence and presence is haunting and seductive. “The Pebble Drinkers” provides much sustenance for the psyche, nourishing it with a plenitude of ideas, symbols and experiences. In this Freudian landscape of objects swirling throughout Gallery Aferro, viewers may come away with varied meanings, but according to Stephanie Williams, the artists are working not only with their personal experiences, but also those of the viewer. She noted, “We are the result of a collection of experiences.” These wide-ranging expressions of experience leave plenty of psychological ground for audiences to navigate. Indeed, the main strength of the show is that it solicits viewer input of the content, rather than demanding passive receipt, to make this show function poignantly and effectively.